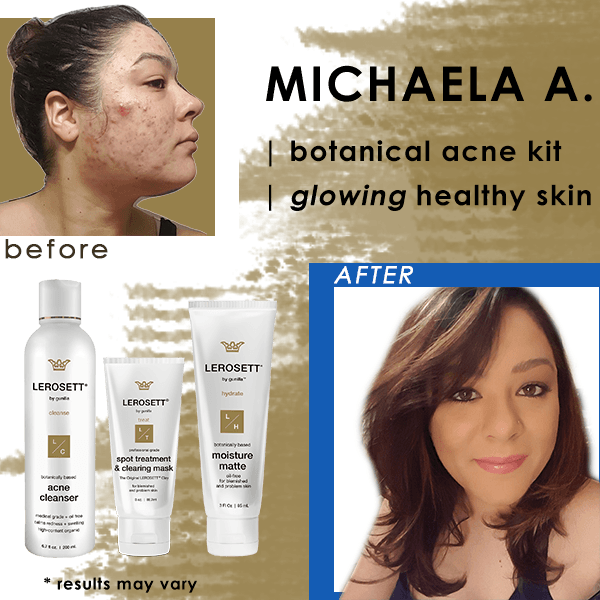 LEROSETT® Botanical Acne Kit is our main acne kit. This popular acne kit helps to quickly and safely fight mild to cystic acne and aid healing, minimizing swelling and redness. Includes our Acne Cleanser Treatment and Moisture Matte moisturizer both based on our unique greenhouse grown 100% organic aloe. Plus our acclaimed Spot Treatment and Clearing mask (100% Organic Clay Treatment without no chemical additives). Deep cleansing without drying and oil-free, non greasy moisturizing for problem skin. Spot treat pimples overnight or full mask for clear skin with tighter pores. 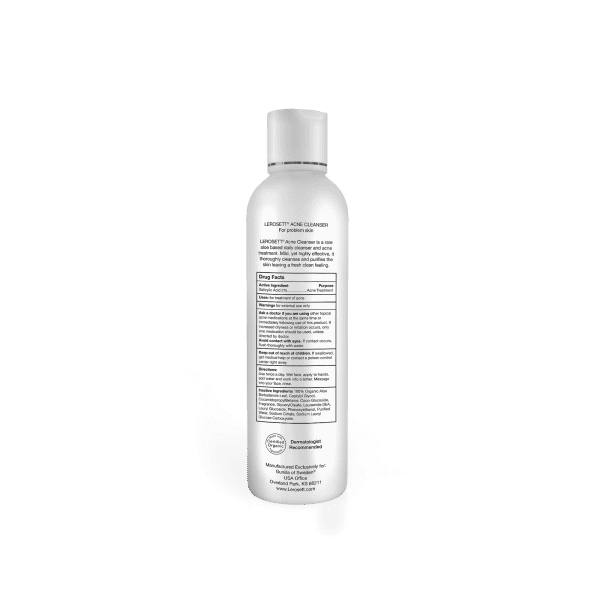 LEROSETT® Botanical Acne Cleanser | 6.7 Fl. Oz. 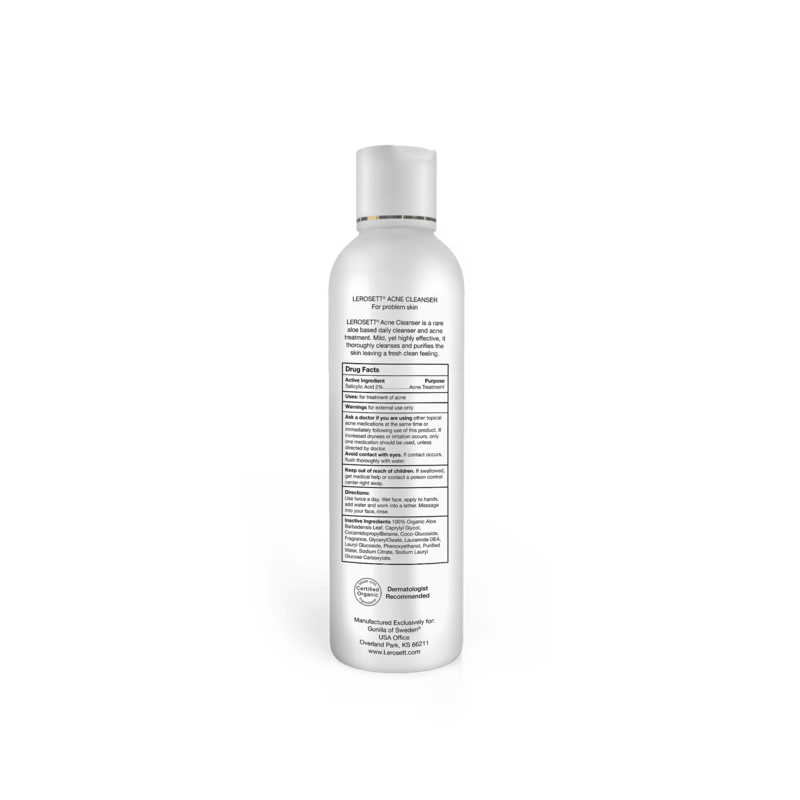 Our acne cleanser is one of the only known acne cleansers based on organic aloe instead of water. With aloe replacing water the skin has a better chance at healing and looking its best. Medicated to exfoliate pore-clogging dead skin cells, help fight acne, and prevent future breakouts while feeding the skin the essential nutrients it needs. LEROSETT® Organic Spot Treatment and Clearing Mask | 3 Oz. Made in Sweden, our proprietarily treated LEROSETT® Clay Treatment is non-allergenic with no added chemicals. LEROSETT® has been a favorite treatment for thousands of dermatologists and skin care professionals for over 30 years. 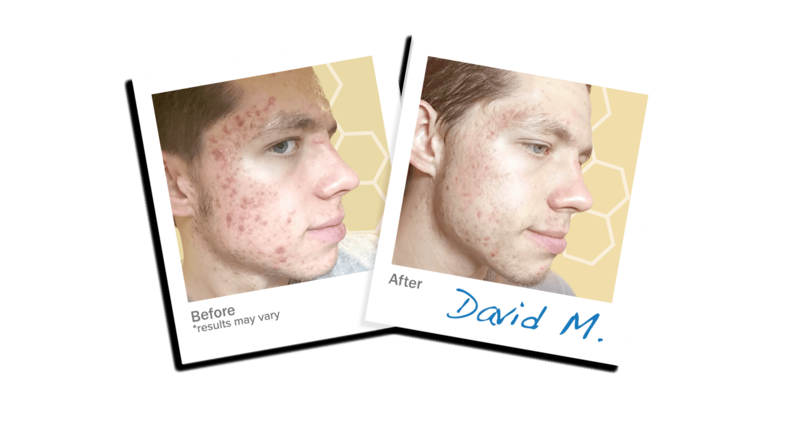 LEROSETT® works to help significantly reduces pimple life-cycles, prevents breakouts, clears skin, detoxes skin and removes impurities. LEROSETT® Clear Skin Moisture Matte | 3 Oz. Created for problem skin this oil-free and aloe based Moisture Matte moisturizer is naturally soothing and nongreasy. With anti-inflammatory and antibacterial elements to hydrate and help heal the symptoms associated with problem skin such as swelling and redness. Using fingertips, apply a small amount of LEROSETT® Botanical Acne Cleanser to the face. With circular motions, work a small amount of LEROSETT® Botanical Acne Cleanser into moistened skin. Facial Mask Method: Apply 100% Organic LEROSETT® in a very light, translucent layer. Gently rub the clay into the skin, allow the mask to dry and work for 10-15 minutes, then remove with tepid water. Repeat as needed. Use more often to get clear and less often to stay clear. Many LEROSETT® users with oily skin will sleep with a thin mask on overnight, apply almost translucently thin on the problem area. Patch test on a small area overnight first, confirming your skin is not too sensitive. Spot Treatment: Do not rub the clay in for spot treatment. Apply over pimple. Let it absorb and infuse as it dries, To stop a pimple from forming, spot treat early and often. Use after extracting a pimple to close the opening and prevent scarring. For spot treating, apply several times per day, or overnight. LEROSETT® Moisture Matte Clear Skin Moisturizer- 3 Oz. Squeeze a generous amount of LEROSETT® Moisture Matte Clear Skin Moisturizer onto hands and rub together. Massage onto face and neck, using upward and outward motions. Use AM and PM. Elder Tree contains a number of flavonoids which are super anti-oxidants that fight free radical damage. This aids in hyper pigmentation, helps prevent and reverse wrinkles , as well as strengthening broken capillaries to reduce redness. Active ingredient: Salicylic Acid (2.0%). Ingredient List: 100% Organic “Greenhouse and Hydroponically Grown” Pure Whole Leaf Aloe Vera Concentrate, Caprylyl Glycol, Cocamidopropyl Betaine, Coco-Glucoside, Lemon, Glyceryl Oleate, Lauramide DEA, Lauryl Glucoside, Phenoxyethanol, Purified Water, Sodium Citrate, Sodium Lauryl Glucose Carboxylate. LEROSETT® Spot Treatment & Clearing Mask: 100% Organic, Micronized & Proprietarily Treated Rasul Clay and distilled water. No added chemicals. LEROSETT® Clay particles are naturally ionic. When activated by water, they act as a (- charged) magnet to pull (+ charged) pimple-causing impurities (like oil, and dead skin cells) and toxins onto the clay particle and out of your skin. That is why you can feel LEROSETT® working with only a 1-millimeter thin layer and why only 3oz equals 30 masks. Unlike common clay products that are crowded by other ingredients like oils, sand, debris or other additives, the ionic attraction will be weakened by those added ingredients. In this case, the clay particles are already coated by the impurities in the product itself. That is why LEROSETT® clay does not contain our special aloe, other botanicals or added chemicals. LEROSETT® clay particles can absorb more oils and impurities in your skin because there are no added impurities in the clay itself. LEROSETT® is a proprietarily treated, micro-filtered, micronized ionic clay and distilled water with no added chemicals. The clay is micronized to reach deep into the skin and heat treated to absorb even more impurities. As a final step natural minerals within LEROSETT® like zinc can increase proteins that can protect against infection and minimize the oil production that caused the clogs in the first place. LEROSETT® has been shown effective for multiple skin conditions for over 30-years. 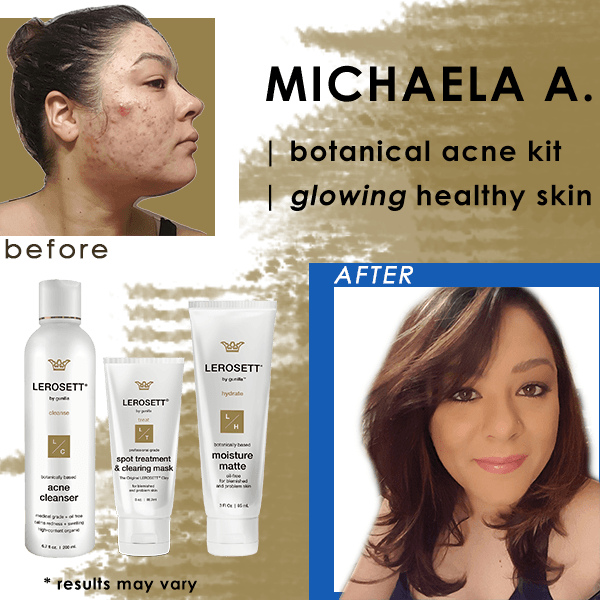 Treat acne breakouts, healing boost, and fade acne spots.